The term ‘landscape approach’ was first coined back in 1992 and has gained popularity ever since with researchers, academics, development workers and governments, so much so that it seems often to be used as if everyone knows what it means; no one is actually defining what is meant, what it does and what the results are of using it. According to Terry Sunderland of the Center for International Forestry Research and the CGIAR Research Program on Forests, Trees and Agroforestry, ‘There is a lot of talk about it but little agreement about just what it is and whether its effective. Landscapes are complex socioecological systems. The confusion of concepts and application of an integrated landscape approach is impeding policy traction and uptake by practitioners. As someone put it: “We use the same words but we aren’t speaking the same language”’. Dr Sunderland was presenting at the World Forestry Congress in Durban, South Africa, on 9 September 2015. Find out more about landscape approaches at the Global Landscapes Forum, 5-6 December in Paris. Register Now! The approach has been seen as a response to the failings of sectorial land-management approaches, he added, and is the latest in a series of attempts to concurrently address conservation, development and restoration challenges. 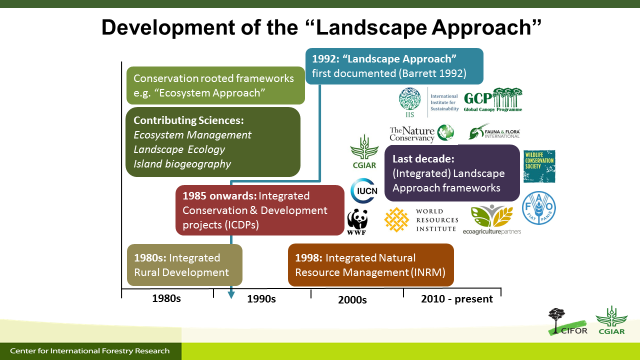 By some, it is seen as a refinement of previous approaches as well as a method to integrate stakeholders at multiple scales; a framework to integrate policy and practice; a land-management strategy to fulfill social, economic, ecological and cultural objectives, including forest restoration; and a tool to assess performance and manage trade-offs within a landscape. Or all of the above. To try and find out which of these views—if any—reflected the reality most accurately, Dr Sunderland and team studied landscape approaches in various projects and settings around the world using a systematic review mapping method. They screened more than 270 000 scientific journal articles and narrowed them down to 82 final studies of relevance. ‘It seemed a rather small yield given all the talk about landscapes’, he observed. ‘Most of the articles were about projects in Africa but that was still only a total of seven case studies’. None of the studied projects focussed on forest restoration; many had livelihoods as their entry point; but addressing water-related issues was the most popular. ‘Not surprisingly, given that what was being written was a form of self-reporting, most of the projects reported success and the achievement of mixed governance regimes’, he said. One of the findings from the review was that projects were usually funded short term. ‘It is important to think of landscapes as dynamic; they don’t just end because a project does. Ongoing management is a key to success. But the project management framework used by development and research agencies doesn’t lend itself to that; three-to-five years is too short’. The team also found that there was a fuzziness about many of the terms involved, not just the ‘landscape approach’: even ‘restoration’ didn’t have a common understanding. This was probably partly a result of the approach itself being under-theorised; people just ‘did it’ without pausing to consider the ideas behind it. ‘There was also a lack of true integration across scientific disciplines’, he noted, which was reflected in a plethora of institutional barriers, with government agencies still being rooted in a culture of ‘silos’. ‘Further, we found concerns about governance, empowerment and engagement; and a lack of appropriate metrics and monitoring’. Looking to the way forward, he said that, ‘It’s clear from the review that it’s time to go beyond rhetoric about the landscape approach and get on the ground and into implementation. We particularly need to fix the disconnect between science and development communities. And more honest self-reporting about implementation in the field would be a good start. Ultimately, we need to operationalise the landscape approach. The Global Landscape Forum is a key forum for helping to turn this around and provide the framework and guidance that will take us all beyond rhetoric and into action’.